In King Lear, the character of The Fool serves many, many different purposes. He is a storyteller, a singer, a jokester, a political commentator, and can be interpreted as the conscience of the aged King Lear. Logistically, King Lear professionally employs The Fool — this position would have been familiar to an early modern audience as a “Licensed Fool” or a “Court Jester” — to be entertainment for his royal court. One of the perks of being an official Fool is the ability and license to speak truth to power without being beheaded for doing so: The Fool is one of the only characters who can insult the king without repercussion. The Fool is wise and quick; he would have to be, in order to sustain himself (like Feste in Twelfth Night or Touchstone in As You Like It) being a Fool by trade. One major difference between The Fool in King Lear and most of the fool characters in other Shakespeare plays is that The Fool in King Lear exists in a tragedy, not a comedy, and is a major character within the play — at least, until his character disappears from the play just over halfway through. 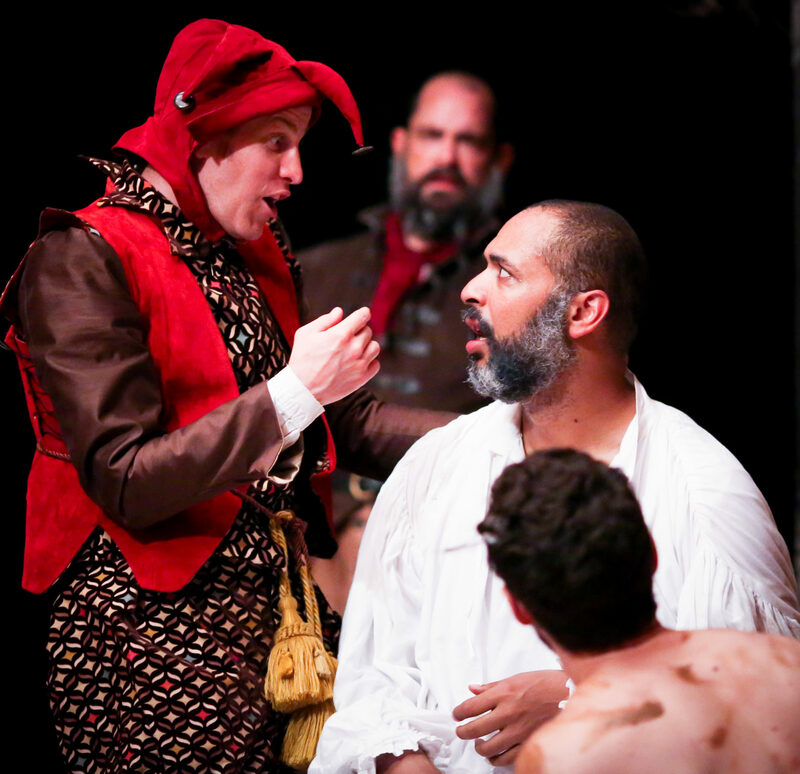 Chris Johnston as the Fool, David Anthony Lewis as Kent, René Thornton, Jr. as Lear, and Zack Powell as Edgar in the ASC’s 2016 production of KING LEAR. Photo by Lindsey Walters. The tradition of the Licensed Fool dates to early medieval times but is also present in today’s culture. Whereas some people would categorize reality TV stars as fools [editor’s note: they totally are, but not by this definition of “Fool”] I would argue they are not employed to be fools. They can be foolish characters (much like Dogberry is in Much Ado About Nothing) but reality TV stars are not employed to specifically entertain the leaders of our political parties while also keeping them humble and connected to regular humanity (as far as I know). Contemporary examples of the Licensed Fool archetype certainly exist, just not in the employ of political leaders. With the end of the monarchical system of government (and along with the general fact that feudalism is no longer a thing in most of the world) jesters, fools, and the tradition of entertainers are now employed by the general population, instead. When Shakespeare was writing, only people who could afford to hire a jester or balladeer or any other form of entertainer would have been able to employ a full-time Fool (after all, they require room & board and probably healthcare). In contrast, the masses all pitch in to pay for our modern “fools.” Clowns like the Marx Brothers, the famed vaudeville family who made many movies where they’d joke, sing, and make political commentary, were a huge hit, and audiences who wanted to see their movies were the ones who paid for them (as opposed to the president or a state governor privately funding those films and screening them only for friends and family). Our fools are people like Steve Martin, Dwayne Johnson, Tina Fey, Kevin Hart, Stephen Colbert, Louis CK: paid entertainers with the savage brilliant edge of a fool. With the advancement of mass media, these modern “Licensed Fools” have taken the form of actors, stand-up comedians, improv artists, and the like — for a “Licensed Fool” is simply an entertainer who is being paid for their services. In Shakespeare’s time, there were fools in the court and people playing fools on stage. American Vaudeville performers were paid entertainers. Today our top entertainers are paid for what they do with huge amounts of money. The Fool in King Lear, however, does more than entertain. Arguably, he is the conscious of King Lear himself. The Fool holds opinions on all of Lear’s daughters and comrades. He shapes the King’s views (or at least the audience’s understanding of the King’s views) regardng Goneril and Regan in Act One, Scene Four by wittingly describing how the two sisters fooled their father. The role of Lear’s Fool reveals the true nature of all the characters using comedy, wit, and the permission to use them. The Fool is a vehicle to express true thoughts, and can be a dangerous character to those who don’t want to hear difficult truths. The Fool and the idea of the Fool asks a question of us: is the entertainment with which we surround ourselves daily also serving as our conscience? Our opinions? Entertainment has a huge influence on how we view the world and the entertainers who get to have that influence are the ones who are paid. Just as the Fool heavily influences Lear’s world view, so do our modern forms of entertainment influence us. King Lear is a deep play with many meanings — we’ve hardly scratched the surface here — which still ring true today, like the role of the Fool: entertainers have the power to speak their minds, and that power can be dangerous for anyone who wants to stop people from hearing what’s on the Fool’s mind.